Long time Wrisk advisor and former MD of Experian David Groom on the opportunities he sees for Wrisk and its stakeholders. "This could really reinvent the way insurance is done around the world..."
While putting together our crowdfunding campaign, we asked a few of our stakeholders: "What do you see in Wrisk?" On the ground at Wrisk HQ, our focus in the day-to-day is our future customers. How can we make our insurance products more useful to them? How can we make our in-app processes more intuitive? What's the best way to communicate with them before we even have a product? When scrutinising the minutiae of your own work from this perspective on a daily basis, you can lose sight of the bigger picture: the impact Wrisk could have on an industry level. We'll be putting up a few videos of people from some of our supportive partners and advisors telling us what they see in Wrisk. 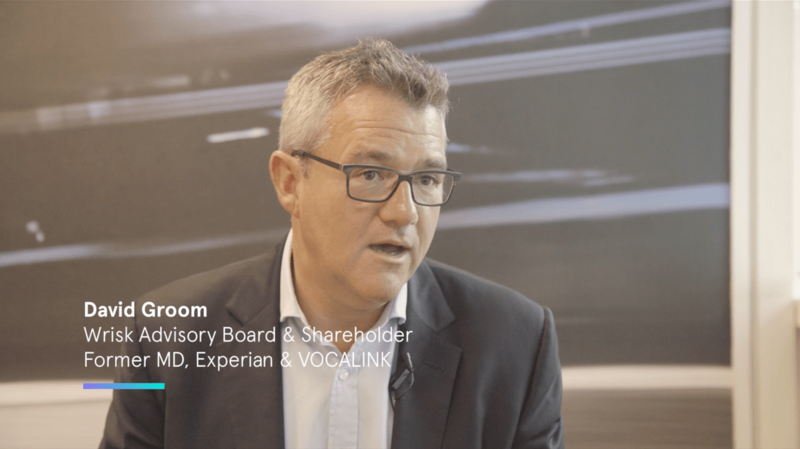 We're starting with long-time advisor David Groom, former MD of both credit reporting agency Experian and payment systems company VocaLink. When we say our Wrisk Score is "like a credit score for personal risk", we know we can back that statement up. "Iâ€™m David Groom. Iâ€™m an advisor to the Wrisk team, Iâ€™ve got a background in technology and data, I ran Experianâ€™s business in Europe for four years, and more recently Iâ€™ve worked on a number of startups, I advise a number of fundsâ€¦ dataâ€™s my thing. So my role is to help the team understand the opportunities that exist around the data thatâ€™s being produced in the insurance industry and how that might help the sector better engage with this client base, better engage with the consumer base, better understand their needs. I think the team represents a really nice blend between deep industry expertise but also great technology insights as well, and I think as the team grows, coupling that sort of cross-functional way of thinking will really allow them to achieve their goals, maybe even earlier than is hoped. So I think through the adoption of new technologies, new business models, the Wrisk team has the opportunity to really unlock some unfulfilled potential in the insurance sector by better understanding consumersâ€™ needs, better understanding their behaviours and really better understanding the risk profile associated with those. Thereâ€™s a chance for the industry to really address sectors and new opportunities that so far havenâ€™t been realised. I think Wrisk is really investable right now. Thereâ€™s already great engagement with major players in the insurance sector, and other sectors as well. A great team is being formed, thereâ€™s a great set of advisors, and actually the existing shareholders are really impressive too. The opportunity is huge, the teamâ€™s going about it in the right way - I think this is a fantastic opportunity to invest in right now. This could really reinvent the way insurance is done around the world."